She recently graduated from the University of Auckland with a Master of Dance Studies, something that seemed impossible after losing her mum and struggling financially. 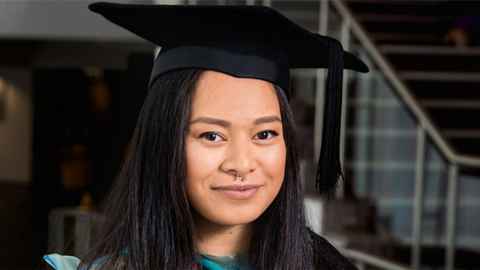 With a Bachelor of Creative Arts from the Manukau Institute of Technology (MIT) under her belt, she took a year off after her mother died. She then enrolled in the Dance Studies programme at the University of Auckland and was awarded the Gavin and Susan Walker Postgraduate Scholarship in Dance Studies. When Ufitia found out that she had received the scholarship it was a huge weight off her shoulders. I cried. Only because I have never felt so stressed prior to hearing about the scholarship. I am so blessed I was chosen to receive the scholarship, and it confirmed I was on the right track by choosing to study. Ufitia’s passion for dancing began when she was a young girl and she was encouraged by her parents to take classes in drama, music and dance. Scholarships enable students to gain qualifications that may otherwise have been out of reach for them. Ufitia hopes more people follow in Susan and Gavin’s footsteps to support students. “I think it is very important to have access to scholarships because they help those who need them the most. Eventually Ufitia hopes to begin her PhD, but for now, her focus is helping the next generation of Pacific dancers.